After their last studio album in 1991, Simple Minds seemed to vanish outright. Considering their artistic trajectory over the previous six years, this was perhaps he kindest conclusion I could have come to. Musically, I was adrift at this time. Most British acts I liked were dabbling in house and techno; two styles whose charms I was largely resistant to. By 1993 grunge was crunching its armored treads over the face of pop music on a world wide basis. I was appalled to hear what sounded like a redux of 1971 sludge rock; as if Bloodrock had shockingly become the hottest sound of contemporary music. Young men with too many drugs and too much testosterone bellowing over dire hard rock were the order of the day. Around this time, my friend chasinvictoria started hosting an “Old Wave” radio show on the local college/community station. It felt like time to look backward since looking forward hurt my eyes. A seminal encounter with The Associates “Popera” CD in Park Avenue CD’s used bins happened to be a life-altering occurrence for this Monk. With my discovery of this album, the notion, heretofore unthinkable, that there might be a lot more great music that I had missed in the ’78-’85 years than was coming down the pike currently, began to manifest. I started becoming interested in the vinyl that had not yet made the leap to CD. The groundwork for my PPM persona was being laid. It seemed that he was helming another Hollywood soundtrack and hit up the band to contribute a track to the [shudder] “Super Mario Brothers” movie. Fortunately, for my brain cells, the track turned out well enough that Simple Minds pulled it for consideration for the soundtrack album and instead asked Forsey to produce their next record. This was fine for me since I always liked Forsey’s production work. 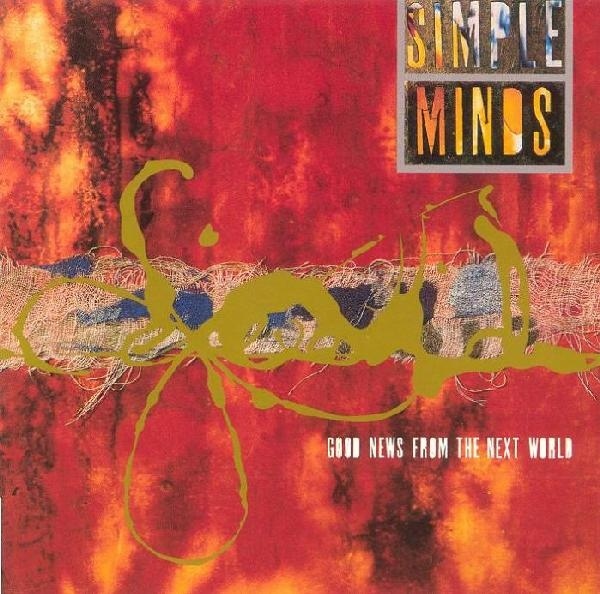 “Don’t You” may have been more banal track than what I was expecting from Simple Minds at the time, but time has proven it to be a better track than many which followed, and the cut always sounded good. As it turned out, the band’s run with A+M Records was over and done with after eight discs, so rights for this new album reverted back to the Virgin Records mothership. In the previous decade, the UK juggernaut had finally succeeded in launching a US branch of its worldwide label; this time without pairing up with other US majors as earlier, abortive attempts had done. The ringing guitar hook on “She’s A River” that alternately pushed and pulled fished me in fairly easily. Since the “band” had by now dwindled to Kerr and Burchill, the emphasis on this album was guitar. Straightforward rock guitar. Burchill’s style, which had begun with songs in the earliest days, and had taken a turn towards the abstract with the second Simple Minds album, had now come full circle. “Real Life” was the first step in the return to riff based rock guitar as opposed to more abstract textural chording, but this album made no bones about it. The rhythm sections and keys were hired session guys. The spotlight was on the duo. I even bought the US CD single of “She’s A River” since it had all but one of the B-sides on the two UK CD singles. As the last ten years had Burchill covering much ground, so had Jim Kerr. He started out sounding almost afraid to front the band. He was certainly a shrinking violet of a lead vocalist like few others. It wasn’t until the time of “Sparkle In the Rain” in 1984 that he got “passionate” …and sloppy. Like a kid with a new toy after the experience of singing to a few thousand Europeans at rock festivals got under his belt. At first, it had some charm with me, plus the band were on fire on “Sparkle In The Rain,” so I could cut him some slack. Then came “Once Upon A Time” and he seemed to delight in going overboard on the over emoting even as the music was locked down and tightly “professional.” The disjoint between the fury of his singing and the boredom of the playing on that album was part of what made it so annoying to me. The live album showcased Kerr at his overbearing worst. “Street Fighting Years” had him reeling in his overwrought tendencies even as the backing tracks became celestial in size; leading to an even worse experience than “Once Upon A Time,” only with the singing and playing roles in the conflicting vibe reversed. “Real Life” suggested an improvement and I could only conclude that this was the album the small gains evidenced on “Real Life” were leading to. And it was. This was a tight, professional modern rock album that had nine good songs, was well produced, sung, and played by all concerned. If it wasn’t exciting as earlier work had been, it was still miles ahead of almost a decade of earlier work by the band. Which by 1995, qualified as terribly exciting for a lapsed Simple Minds fan used to disappointment. The most important thing about this album was that I really couldn’t point to any mistakes, or lapses of judgement by the group. If I could play God, I would slot Good News From The Next World right after Sparkle In The Rain…even the album title sounds like it belongs next to it. Musically it has the power and energy of SITH while being more in your face. Burchill and Kerr play with rhythm in a stronger way than one the three previous studio albums and Kerr’s vocal bluster is a bit more reigned in or maybe I should call it controlled. I will readily admit that I took over a decade to warm to Good News…I didn’t give Simple Minds or rock and roll for that matter, much attention in the mid 90’s. I had discovered the joys of deep house music and was deep down that rabbit hole after most every band I cared about had imploded, failed to maintain or just disappeared. ’95 was when I stumbled upon Electrifixion – Burned, McCulloch and Sargent’s initial attempt at working together again post Bunnymen, was probably my favorite album of 95 followed by Shack’s Waterpistol, Jamiroquai’s Return Of The Space Cowboy and Morrissey’s Southpaw Grammar. If I were to reassess, I think Good News would make it into a favorite for the year. Echorich – At the time, this was the lifeline I had been waiting for after “Sparkle.” It was the first of their “Best Since Sparkle In The Rain” albums. At the, time, I wildly overpraised it, but now, with the benefit of hindsight, I have dialed down the hype factor I indulged in back to responsible levels, and it’s still a great album to listen to. But this was the album that rekindled the dormant spark, big time. I recall really wanting to see them live when this came out. I really liked Electrifixion to. I regret not seeing them in a club in Orlando at the time, but I was down on the club. I haven’t heard GNFTNW recently enough to judge, but I recall the excitement of hearing — and playing on my show — Electrifixion for the first time. It was like hearing Jesus + Mary Chain for the first time, which in itself was like hearing Echo & The Bunnymen for the first time! The year 1995 was one where a lot of “new sound” albums were coming through that were not, of course, all that new — just much more “rock” than had been previously emphasized in the previous five years or so. Oasis, Elastica, Supergrass, and my pick for album of the year, Pulp’s Different Class — Electrifixion fitted nicely into that “Cool Britannia” sound, making it a half-decent year for music (though there was a lot of really dire crap put out that year as well). Sure a lot of it was redone Sixties UK rock, but that’s a good source to draw from. I’m reasonably sure that Good News would have made my top 20 (maybe) at the time, but not the top 10. Still, it was the first time I’d even thought about them since they “made it big” and you started wanting to escape that music rather than listen to it. I remember “She’s a River” well, and another song that got a bit of airplay — was it “Hypnotised”? — but not much else from there. chasinvictoria – Those were the singles, and they were pretty good ones, but the deep cuts offered my ears more. 1995 was pretty dire, so I think that this solid album by a fave on the rebound would have been top 10 material. Especially when one takes into account how many 1995 releases were actually bought in that calendar year. It must have been pretty scant since I was saving for our marriage/home down payment during that time. Other than “She’s a River, ” which I’ve heard a few times recently at over the music system at Publix (which by the way, actually plays some decent music), I don’t remember a single thing about this album other than it being better than the Real Life. I’ll give it a spin today in advance of the rest of the GPA and see how my assessment compares. That’s a ‘New Wave’ who’s-who! Echorich – I hear the same stuff at EarthFare, the health food chain that began locally. Face it. [grimaces] We are the new Classic Rock! Echorich – That’s true. Now that I think about it, even thought we are 50-60, we still listened to niche music that barely got a wide viewing. I’ve been privileged to hear both “Life Begins At The Hop” and “Mayor Of Simpleton” as well as “I Got You” and “One Step Ahead”. But when I heard “CloseTo The Edit” I realized anything can happen at Publix on a Sunday night. Brian Ware – We are finally getting a Publix where we are to open this Spring. It will be amusing to see how they do here. All the expat Floridians are waiting with bated breath. I’ve recently gotten Joe Jackson, The Police, Everything But The Girl and The Style Council here in Tampa. I have definitely heard Mayor of SImpleton in mine before as well!